The Rally Model 717 3 wheel walker/ rollator offers many great features in a 3 wheel walker at an economy price. This 3 wheel walker weighs only 12 lbs. and is easy to fold and transport, with the one touch glide folding knob. Locking loop brakes allow added safety. 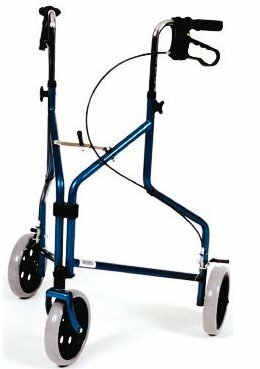 The handles are height adjustable from 29.5" to 39.5" making this a very versatile walker to fit many patient heights. The Rally 717 comes standard with a folding pouch.